Does it matter if nature solves the same problem multiple ways? A NSF-supported study of lizard populations in White Sands, New Mexico has helped researcher Erica Rosenblum of the University of Idaho begin to answer that question. Published December 28 in the Proceedings of the National Academy of Sciences, the article describes genetic differences between lizards found in habitats that contain white or dark soils. These stark differences in color are an ideal environment to study natural selection and gene flow. In three separate lizard species, Rosenblum and her team identified mutations in the gene encoding the melanocortin-1 receptor (Mc1r), all resulting in lizards with light skin. Further biochemical characterization of the mutations revealed that, although the same gene is affected in two of the species, the functional changes caused by the mutations were distinct. In one species the receptor is in the wrong location in the cell, while in a different species the receptor is in the correct location, but it is unable to transmit signal. "The mutations we observed resulted in two distinct changes in how the Mc1 receptor functioned. Mc1r acts like a light switch for melanin, so even though the way the signaling is disrupted is different, outwardly we see the same result: light-skinned lizards," Rosenblum explained. Although the end point, light skin, is the same, the different ways the reptiles achieve this have important implications for gene flow in each species. For instance, the dominance pattern of the mutated genes is different in the two species. The mutation that results in improperly located Mc1r protein is dominant, meaning it takes only one copy of the new gene to result in light-skinned lizards. 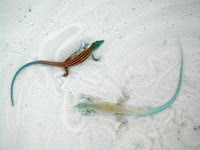 In contrast, the lizards that appear white due to faulty receptor signal transmission must harbor two copies of the mutant gene because the trait is recessive. Rosenblum added, "There is preliminary evidence that suggests the genes involved in adaptation can also affect speciation. Changes in melanin affect coloration on the top of the body, which predators see, and also the sides of the body, which other lizards use to decide who to mate with. Therefore both natural selection and sexual selection appear to play a role in this system." This habitat provides researchers the unique opportunity to observe natural selection and speciation in progress. New species can form relatively quickly (over a few thousand years) in some selection environments, but catching organisms in the act is rare. The more researchers understand the speciation process, the better equipped we will be to try to preserve this process as our landscape changes.